The successful pop star, Justin Bieber, was sued for $650,000 in the Superior Court of Quebec (the “Court”) by a Montreal event promoter (9302-7654 Quebec Inc. (Team Productions) c. Bieber, 2017 QCCS 1100). The plaintiff, a company carrying on business as Team Productions, organized and promoted a birthday event at the Beach Club in Montreal for Kylie Jenner, a prominent socialite. Justin Bieber was scheduled to appear at the event, Jenner’s 18th birthday, for a fee of $425,075 USD (of which his agent kept $75,075). The plaintiff considered the tweet to be false and defamatory and sued Bieber for lost earning potential ($500,000), damage to reputation ($100,000) and punitive damages ($50,000). As regards the relationship between the parties, the plaintiff entered into a contract with Bieber’s agency, Mr. Smith Entertainment (“Mr. Smith”), with the latter acting “as an agent for Artist [Bieber] under this Agreement” in order to secure Bieber’s presence at Beach Club on August 22, 2015. This contract, while referencing Bieber as well as containing obligations for the artist including publicizing the event on Twitter, Facebook and Instagram, contained an arbitration clause binding the parties to submit all disputes “arising under, concerning, relating to or touching on this agreement” to arbitration in California. The contract also specified that it would be governed by California law. A second contract was entered into between Mr. Smith and Bieber regarding the latter’s appearance at Beach Club. While this contract included many of the same terms and conditions as those contained in the first contract, it also more fully outlined Bieber’s appearance obligations and conduct, including a covenant against any disparaging remarks regarding the event, the promoter or the venue. This contract also contained the same clauses pertaining to arbitration in California and California governing law. In response to the plaintiff’s claim for $650,000, Bieber argued that the dispute was subject to the California arbitration clause contained in both contracts and that despite not having contracted directly with the plaintiff, he was represented by his agent, Mr. Smith in the first contract and the two contracts refer to the same event and therefore form a group of inter-related contracts. Finally, as both contracts contain the apparent intention to have any issues resolved by arbitration, the issue of jurisdiction should be first put to an arbitrator in lieu of the courts. The plaintiff contested submitting the dispute to arbitration in California, arguing that there was no contract in place between itself and Bieber; the first was between and signed by Mr. Smith and the plaintiff, while the second did not involve the plaintiff. Furthermore, the plaintiff argued that its motion is based on defamation (i.e. Bieber’s tweet regarding the event) and is not contractual in nature, but ground in tort. The Court underwent an analysis of the legal principles to be applied when a party requests that a dispute be referred to arbitration. Highlighting that arbitration is voluntarily and rests on the parties’ decision, the Court explained that both the Civil Code of Quebec[i] and the Code of Civil Procedure[ii] provide that courts lack jurisdiction if a matter is subject to arbitration. The Court cited two Supreme Court of Canada cases[iii] which ruled that when an arbitration clause exists, any challenges to the jurisdiction of the arbitrator must first be referred to the arbitrator and courts should only derogate from this general rule where the challenge to the arbitrator’s jurisdiction concerns a question of law alone. Where the validity of the agreement and the applicability of the clause are not contested, the court has no jurisdiction to hear the matter. The Court determined that although Bieber was not a party to the first agreement between the plaintiff and Mr. Smith, he was nonetheless contractually bound to the plaintiff as Mr. Smith signed the first agreement “on behalf of the artist, Justin Bieber” and the entire purpose of the contract was to secure Bieber’s presence at the promoted event. All of the obligations contained in the first agreement referred to Bieber and he also retained the right to cancel the contract. Moreover, the fact that Bieber was not paid directly by the plaintiff and it was, instead, Mr. Smith who obtained payment, did not negate the obvious mandate in this case. As such, the Court considered that Bieber was bound to the plaintiff by the initial contract, which included the arbitration clause. The plaintiff argued that as its claim was based on defamation, it therefore did not stem from the first contract and was not subject to the arbitration clause. The Court reviewed the arbitration clause, which covered “all disputes arising under, concerning, relating to or touching on this agreement”. Referencing another Supreme Court decision[iv], the Court explained that an arbitration clause and, therefore, an arbitrator’s mandate, must receive a liberal interpretation. 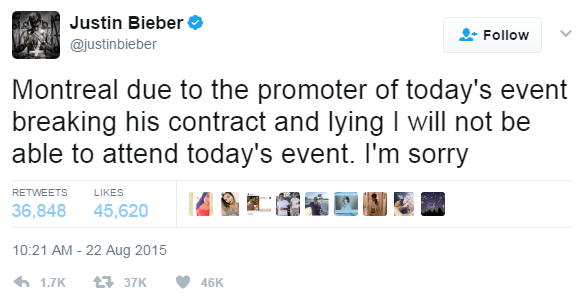 In this case, although the lawsuit was based on defamation, Bieber’s statement and actions have a direct connection with his contracted presence at the Beach Club event on August 22, 2015; the tweet was about and referred directly to the plaintiff as well as Bieber’s scheduled appearance that day. A liberal interpretation of the arbitration clause found in the first contract (to which Bieber was considered a party) necessarily results in finding a link between the contract and Bieber’s tweet and actions. The Court considered, therefore, that the plaintiff’s lawsuit was connected to the contract and subject to the arbitration clause contained therein. The Court referred the parties to arbitration in accordance with the arbitration clause contained in the contract binding the parties. The decision in this case demonstrates the Quebec courts’ inclination to refer disputes to alternative methods of resolution (such as arbitration) given the new rules contained in Quebec’s new Civil Code of Procedure. In effect, the Court established a contractual connection between the parties despite there being no actual contract signed by the plaintiff and the defendant. This decision can be find here. [i] Article 3148, par. 2. [iii] Dell Computer v. Union des consommateurs,  1 S.C.R. 801 and Rogers Sans-Fil inc. v. Muroff,  2 S.C.R. 921.